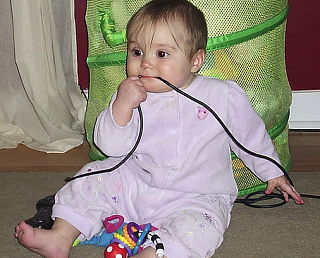 Extra long electrical wires, including extension cords and phone cords, may trip your little one - and are tempting for your baby to tug or chew on. 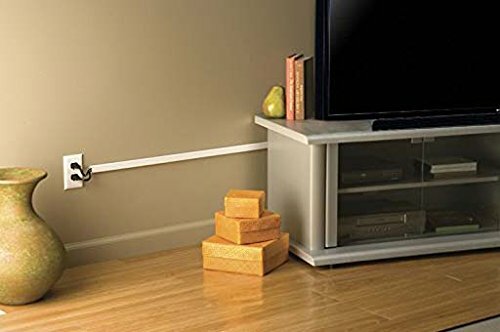 These cord holders will hold those loose wires snugly against the wall. Just cut 2+ pieces of 1" (5cm) wide sticky-back Velcro® about 2" (10cm) long. Place the sticky-back side Velcro® pieces along your baseboard, or wall, where the cord runs along - a foot or two (30-60cm) apart. Stretch your cord out tight and place the other side of the Velcro® over top of each piece attached to the wall, to hold the cord in place. Use as many pieces of Velcro® as you need to hold the cord securely to your wall.